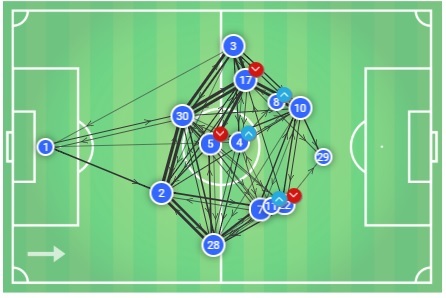 This match analysis first featured on our dedicated Chelsea site, feelchelsea.com. Another week and another unbeaten battle. Sarri men are doing it all well whether home or away. 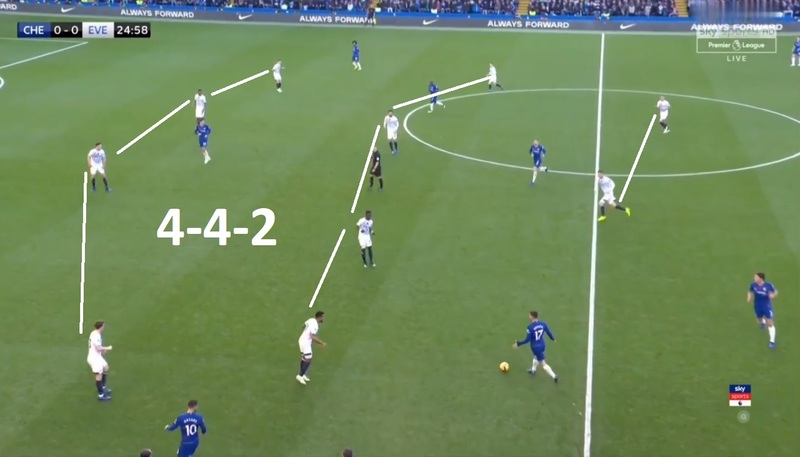 However, Everton didn’t stop getting on Chelsea’s players with their well-coordinated positional marking scheme. The away team didn’t contribute offensively much but stopped the Blues to compose the vertical offensive patterns they need to make starting from the first line and concluding successfully at the last. The tactical analysis below shows how Chelsea was too restricted to work on the ball as much as it needs to be done even. 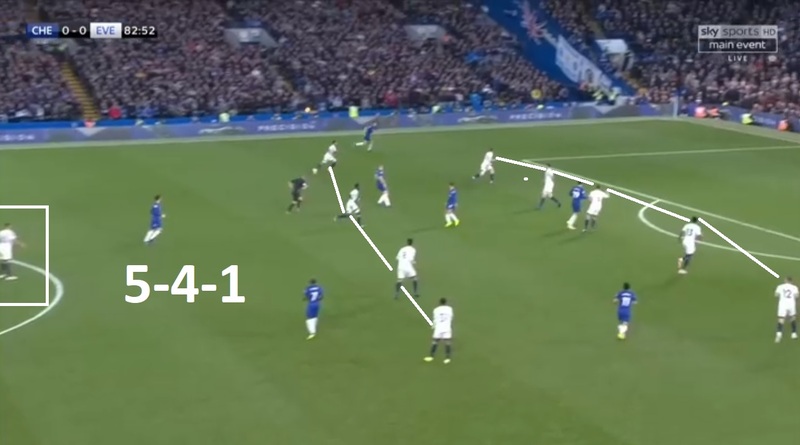 The analysis also highlights what another tactical aspect Sarri’s men would need to add into their plan so they can make the most out of their even restricted on-the-ball work. Everton started strongly at front foot and executed an aggressive high press throughout the first half in a 4-4-2 defensive formation. 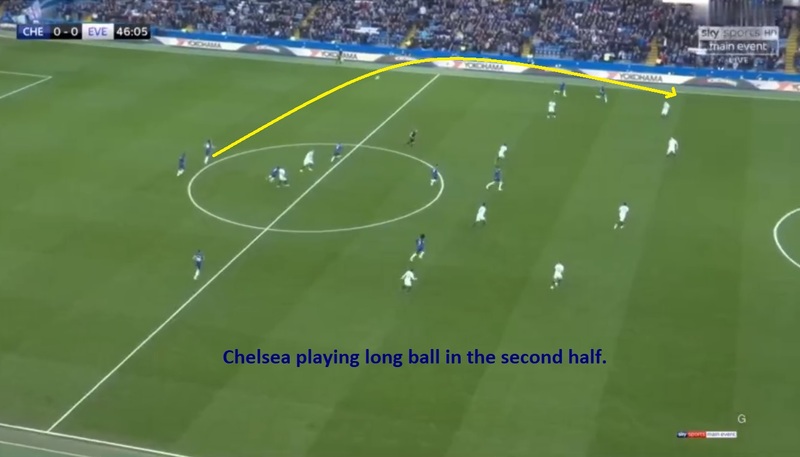 The back line stayed back consistently to protect the defensive third while the farther lines looked out Chelsea’s back and mid-line to prevent the Blues’ build-up from the back. The away team wingers got on Chelsea’s fullbacks whenever the latter attempted to make any on-the-ball moves from the respective width. The wingers didn’t execute tight man-marking instead the position-marking. Whenever Alonso or Azpilicueta came into position to play the ball, they faced the press. However as any of them had to cut inside, the responsibility to press them shifted from the winger to the adjacent defenders. The away team wingers didn’t prefer following their respective fullbacks and stuck on protecting the width. The front two of Everton, along with the mid two, squarely marked Jorginho. This not only blocked his way off his teammates but also shrank the space between him and his adjacent central midfielders. Only Jorginho was religiously man-marked while the other Chelsea players were marked based on their positions and on-the-ball actions. In the second half, Everton became a more compact defensive block so they would rely on counterattacks. The winger Bernard substituted out for Lookman to have the more offensive presence to pick up the counters. And by the last quarter, Everton shifted to a complete low block 5-4-1 defensive shape. Everton’s 5-4-1 shape in the last quarter. As Chelsea has struggled offensively in a few matches before when their build-up got disturbed, Everton got the hint to stop Chelsea. 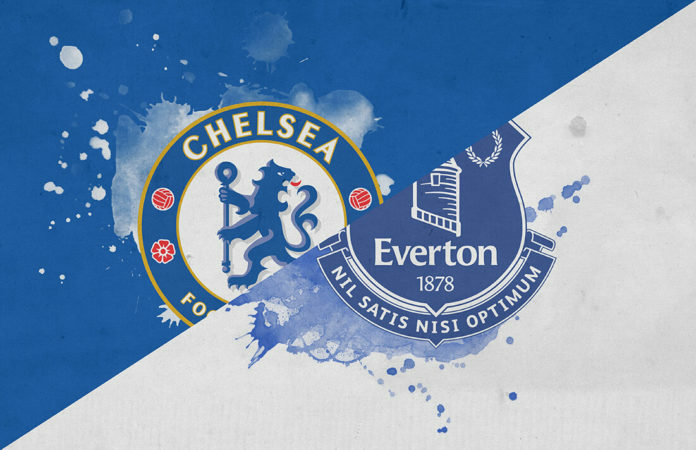 By having all the men especially those in the farther lines mark Chelsea’s players and watching out the key positions, the Toffees effectively disturbed Chelsea’s build-up throughout the game. Chelsea didn’t get to do much into the offensive half of the pitch, as shown by its passing stats too. The home team played the smallest number of passes, only 12.73 per minute and 7.85 per possession, since its recent draw against Manchester United – that was the last time when Chelsea had their build-up events disturbed throughout the game as the team was under a coordinated man-marking of Mourinho men. The pass per minute stats against Everton is even smaller than Chelsea’s average of the season. Chelsea is also reported to make the shortest accuracy of the aerial duel won, 27.6%, which explains how disjoint the team’s structure was to win the duels while transitional defending. Even the first true goal-scoring opportunity was made by Chelsea in the closing minutes of the first half with Willian’s free kick. Other than that, Chelsea got to create goal scoring opportunities more in the second half than in the first. But these opportunities were mostly the outcome of quick build-up, transitional attacks, and long balls. The shots played were also from outside the box. Chelsea set the longest average shot distance against Everton at 20.55 yards. Kovacic’s through-pass to Hazard in a transitional attack. The latter shot if off the target from outside the box. Chelsea attempting long ball since the start of the second half. Chelsea did manage to make successful offensive patterns allowing them to get into the goal area – the expected goal, xG, stat of the Blues is 1.53 for Chelsea implying the home team wasn’t that bad offensively. 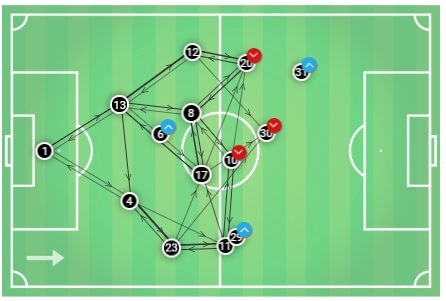 Chelsea was able to make a coherent passing structure as shown in the pass-map above. However, Everton’s high press especially throughout the first half did enough work to keep Chelsea restricted and under pressure. Then the staying back of the away team’s first line outnumbered Chelsea’s limited number of advanced players. 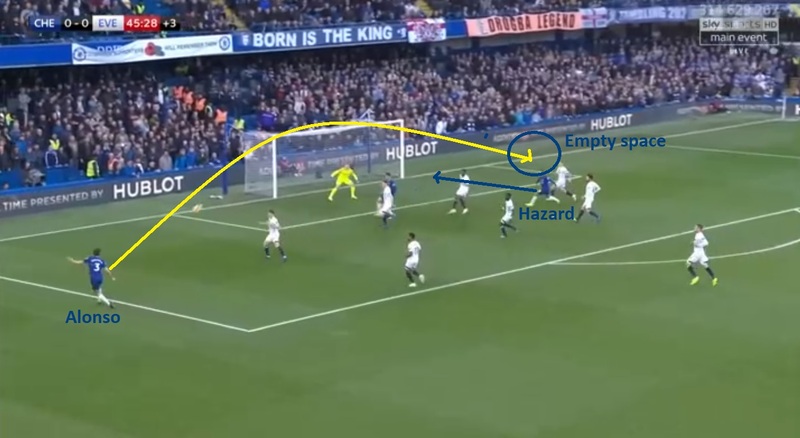 Since there was Willian instead of Pedro for most of the game until the latter was substituted, this also caused a lack of off-the-ball offensive moves and pick-ups in the goal area during the transitional attacks. Alonso’s assist got missed as no one was there to pick it. Willian was way behind. Besides, since there was Kovacic instead of Barkley until the latter was substituted in, Chelsea lacked enough resources in the attacking midfield to outnumber the opponents and win over the press to retain and conclude their attacks successfully due to Kovacic being more into defending his position than into attacking. 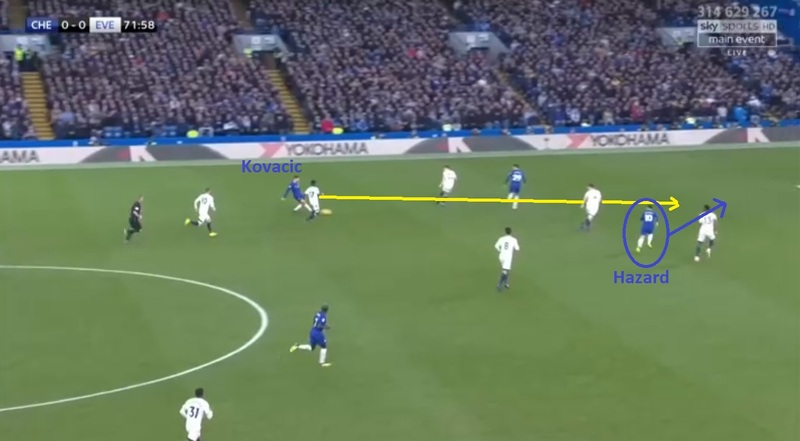 Otherwise, if speaking to the defensive midfield, Kovacic did get a few chances to pass through the final third when Everton’s press shuffled for some instances in over-marking Jorginho. 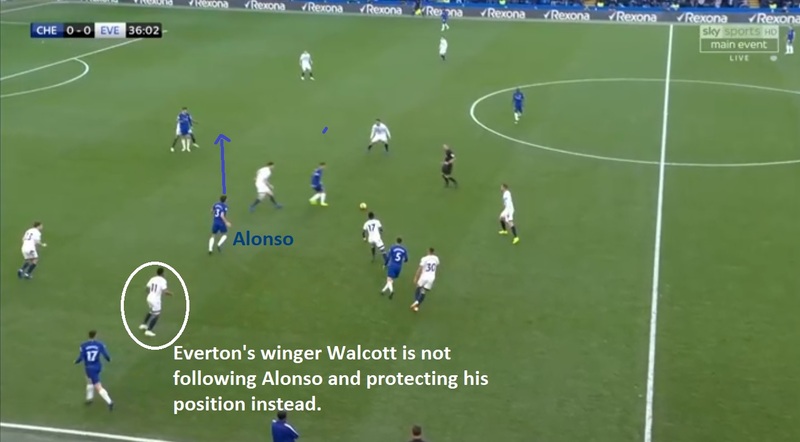 That Everton occupied resources in setting such a defensive arrangement already reflects attacking as their secondary focus only. They made a very insignificant number of goal scoring opportunities and out of those, their shot attempts were from the long shots or quick build-ups mostly. The away team’s expected goal xG score was as low as 0.11, which is closer to zero and reflects the absence of the attacking mindset of the Toffees even after making some random opportunity-bound attacks. The pass map of Everton shows how disjointed its front line is with the rest of the team. The xG and passing stats of the two teams are thus quite contrary to the scoreline which may put both the teams equally competitive. Chelsea allowed Everton very few passes per defensive action (PPDA) i.e. just 5.41 which is the shortest number of passes per defensive action Chelsea allowed its opponents in the current Premier League season so far. This again reflects that Everton was not there to dominate attack and control against Chelsea’s defence but to disturb Chelsea’s build up instead. Comparing the stats of passes played into the final third of each team for each’s interceptions made, we can say that Everton was even less involved in converting interceptions or ‘winning of possession’ into opportunities than was Chelsea. For each interception made, Everton made just 1.1 passes into the final third as compared to Chelsea which played as much as 2.4 passes into the final third for each interception made. Thus, even though Chelsea couldn’t offensively perform as good as it’s been throughout the current season so far, it was still able to outperform Everton, looking at the stats. The home team also missed the target twice by hitting the posts. Yet still, looking beyond the stats, there is something missing in the Blues’ strategy which caused them a draw and not three points. That’s their off-the-ball plan. 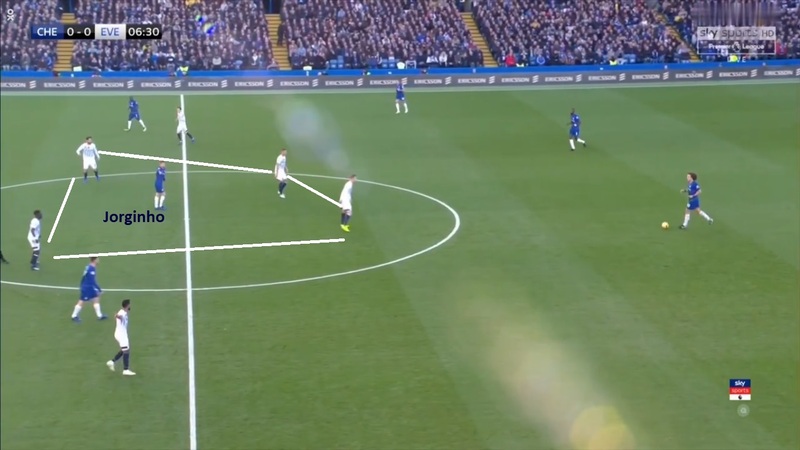 Since in Sarriball, the on-the-ball positions of Chelsea players are set so as to form offensive patterns, the Blues may get readable when in an attacking phase. This calls for the need of a tactical plan to work on off-the-ball positions. Chelsea doesn’t have any shortage of players who are quick to make off the ball moves. Pedro, Alonso and Barkley are top of them. In the underlying fixture, Jorginho who was man-marked all the time could have shuffled the press with his off the ball moves. All in all, Chelsea need to be better off-the-ball in a coordinated manner. Serie A 2018/19: How are Juventus using Cristiano Ronaldo?